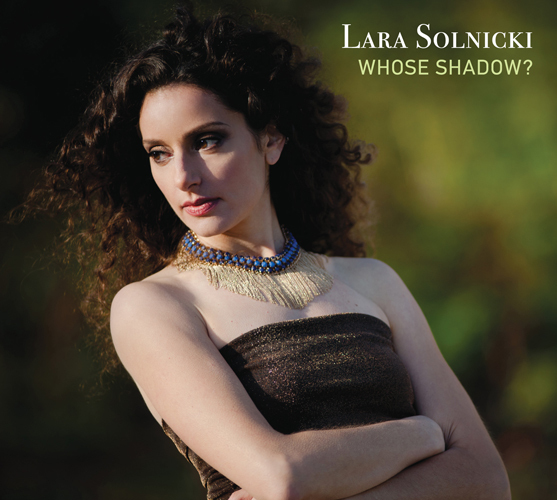 While listening to “Whose Shadow?”, I marvel at the wealth of lyrics, messages, and the clear vibrato pitch which singer and composer, Lara Solnicki, gives to her chosen songs. No wonder! She has married her love of poetry with music. Her classical operatic training as a Verdian soprano melds nicely with her verbal creative side which authors and re-produces an exciting array of lyrics definitely worthy of the listener’s ear. Toronto-born daughter of filmmaker/author parents, Solnicki released this self-produced second album in March 2014; it became #1 on Radio Canada’s jazz charts following its Montreal launch in December 2014. Her book of poems and experimental prose, “Disassembled Stars” (Lyrical Myrical Press) was published in 2006, and her poems continue to be read in Canadian and international magazines. Perhaps it was her poetic improvisational tendency that led her down the contemporary jazz lane. Besides her private voice teaching Solnicki continues to play in jazz circuits within Canada and beyond, when time allows. “Whose Shadow?” presents a splash of lyrics with a Jodi Mitchell feel. But it’s Solnicki’s wide vocal range and crisp diction that delivers a highly melodic and soothing musical experience. One warning: like the title suggests, the songs move through misty, sombre, and at times, gloomy soundscapes, but carried by her respectable timbre. It’s about shadows…. ‘Sunset’ is a Kate Bush song of iridescence, remembering the day’s activities and praising its crimson-turned-rust end, as the sax seems to hail in this display of colour which frizzles as dusk prepares us to bed down. Several octaves are reached on ‘Freedom Dance’ and ‘Jim the Dancer’. In the latter, John Johnson’s bass clarinet, in a thoughtful melancholy, steers this sultry melody as the Dancer follows suit, hitting some high notes and displaying the instrument’s equally wide range as does Solnicki’s voice. A jewel of a song. ‘La Flute Enchantee’, sung in French, swings into a fast bebop featuring a masterful piano and double bass duet, then a flute punctuation with bird-like replies. Solnicki’s vocals takes us mystically into nature’s nuances in this wonderful song, my favourite on the album. ‘Music for a While’ has a classical direction with an operatic pull, influenced by Ravel and Purcell, perhaps. In ‘A Timeless Place (The Peacocks)’, a Jimmy Rowles song, this is not an easy climb through intricately weaving tonal scales and pithy lyrics. At best, Solnicki shows she can dare!